Ventral hernia repair is increasingly performed by laparoscopic means since the introduction of dual-layer meshes. 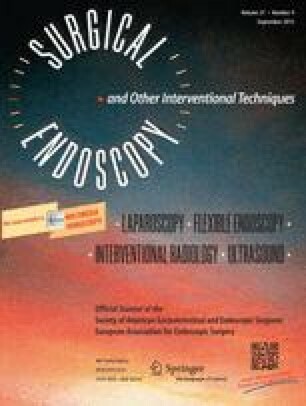 This study aimed to compare the early complications and cost effectiveness of open hernia repair with those associated with laparoscopic repair. Open ventral hernia repair was performed for 92 consecutive patients using a Vypro mesh, followed by laparoscopic repair for 49 consecutive patients using a Parietene composite mesh. The rate of surgical-site infections was significantly higher with open ventral hernia repair (13 vs 1; p = 0.03). The median length of hospital stay was significantly shorter with laparoscopic surgery (7 vs 6 days; p = 0.02). For laparoscopic repair, the direct operative costs were higher (2,314 vs 2,853 euros; p = 0.03), and the overall hospital costs were lower (9,787 vs 7,654 euros; p = 0.02). Laparoscopic ventral hernia repair leads to fewer surgical-site infections and a shorter hospital stay than open repair. Despite increased operative costs, overall hospital costs are lowered by laparoscopic ventral hernia repair.